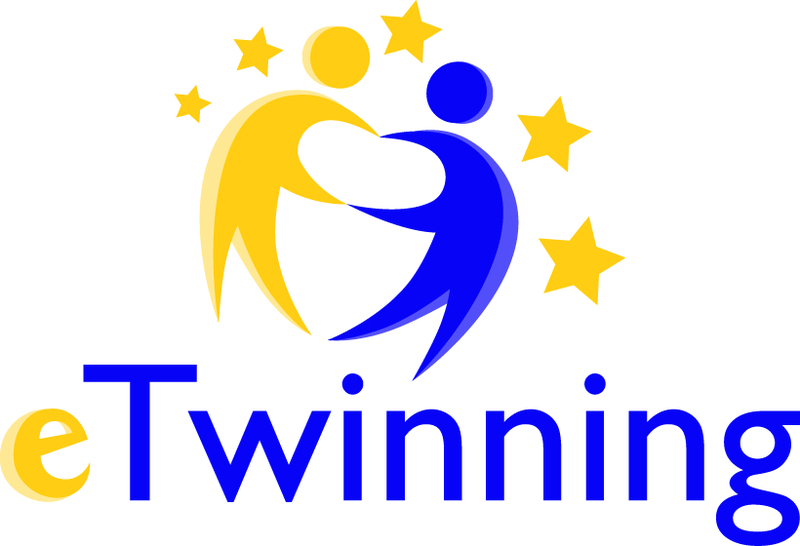 This book is a digital guide written by students of Severo Savioli High School in Riccione, Italy and Stefan Zeromski High School in Kielce, Poland as part of eTwinning project “I Tell You My Place”. It is the first product of our cooperation based on students’ personal choice of their favourite places in their hometowns. The task was to write a detailed guided description of a chosen place and upload a photo as well so as to make Polish/Italian students familiar with the hometown of their partners. All the texts and most photos are therefore students’ original work frequently containing their personal comments and memories associated with the places. In some photos you can even see the authors themselves. Having performed this task, students could meet via Skype to comment on it and ask questions. They were then asked to do a Kahoot quiz prepared by their teachers on the basis of the Ourboox activity so as to increase their knowledge of Riccione/Kielce even further. All roads in Kielce lead to the cathedral! Kielce is a great city with a lot of old monuments. One of them is Cathedral Basilica. It is located on the Castle Hill in the heart of the city. Founded in 1171 by the Cracow bishop Gedeon, it was then a small Romanesque church. In the13th century there was a fire but the church was rebuilt. The church was expanded over the years to become cathedral and then basilica. In 1990 John Paul II’s Square was modernised and the new altar was built. The roof was repaired. In 2007 works on arranging the square started. The walls of the cathedral were restored. The work remains anonymous. If you are in Kielce, you must visit the Cathedral Basilica’s interior. 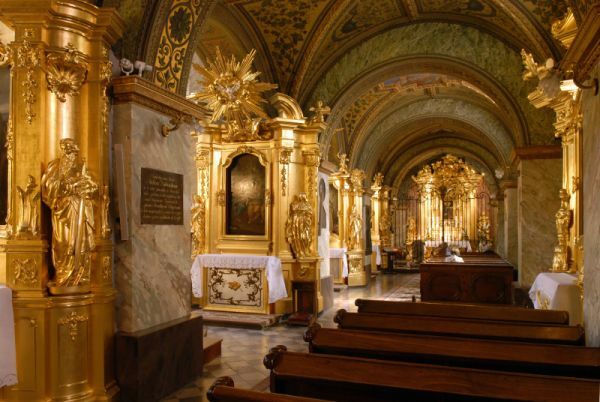 There are many paintings and the gold altar. Tourists can also see the cathedral’s treasury and the underground tombs of the bishops. This church is the best example of the Baroque style. When we were there for the first time, we were amazed. Cracow Bishops’ Palace was the residence of the Cracow bishops. It’s located on the Cathedral Hill. Earlier, the palace was surrounded by a defensive wall with shooting ranges. Since 1971 there has been the National Museum. There are very valuable exhibits. This is the place worth seeing. Twelve years ago the Italian Garden was created behind the palace. It’s a very famous place in Kielce. Many people visit the garden just to take perfect photos. The best place in it is a blue bench. Everyone has got a photo on it! In the garden we can go through narrow avenues and admire beautiful shrubs, trees and flowers, but also the panorama of the centre of Kielce. There is always peace and quiet, so it’s a perfect place where we can sit and relax. The entrance to the garden is free. Thanks to that there are more people there. Students like to spend time there after a hard day at school. Who hasn’t been here yet must come! It’s really worth visiting. No one really knows what’s so special about it but everyone has a photo on it! So once you’re in Kielce, you need to take it here as well. Here’s another option for more courageous ones. This window might not be as famous as the blue bench but the photo taken like that will definitely be more effective. Just be careful so as not to fall down. 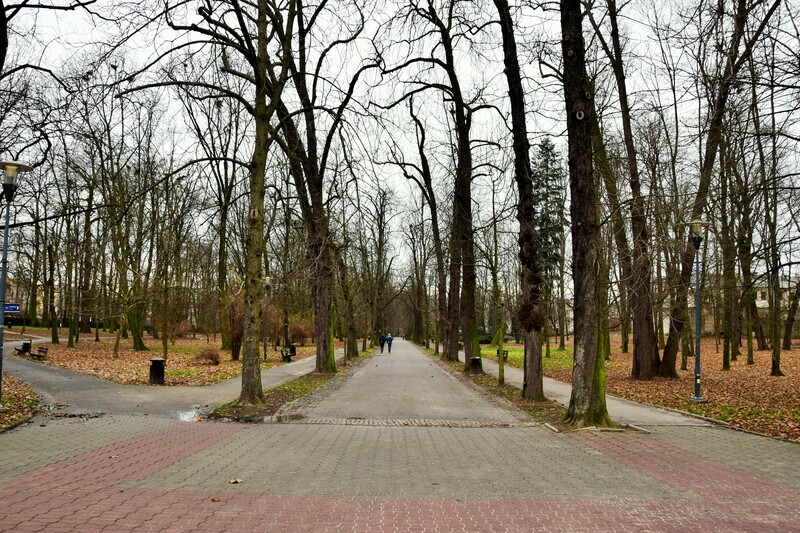 The City Park named after Stanislaw Staszic (Polish writer, philosopher, naturalist and priest) is one of the oldest parks in Poland, with a large area situated in the city centre. It was formed in the 19th century. In the western part of the park there’s a big pond with an ornamental fountain. Formerly there was a possibility of boating on the pond. The park has many statues of famous people including Stefan Zeromski – the patron of our High School. There’s also an aviary, where we can see many unique birds. The park has about 1300 trees and what is interesting – some of them have more than 100 years! Many historic trails pass through the park. This is a perfect place for a meeting with friends, a walk with family or a date. Around the park there are plenty of cafes, restaurants and shops. Especially in the summer there are organized various festivals and contests. Children can have a ride on a pony, feed ducks or have fun in the big playground. But mostly this is the place where we can take a break from everyday life. It’s really worth visiting. Our favourite place in Kielce is the Park. In this place we can meet friends but also there are many shows, for example many people dance or sing. I danced here too! And that was great. People in Kielce are so friendly and I was given a big applause. My classmate Agata took part in the contest “Kielce Running” here and she was so happy. 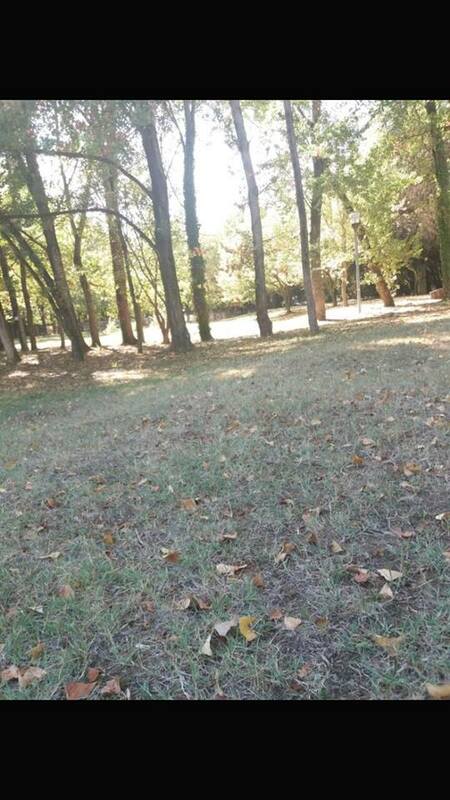 In our park there are many different events, for example our class met here for the first time. We met the best people from our class. This day has changed our life. We have also a lake here and people can feed ducks. 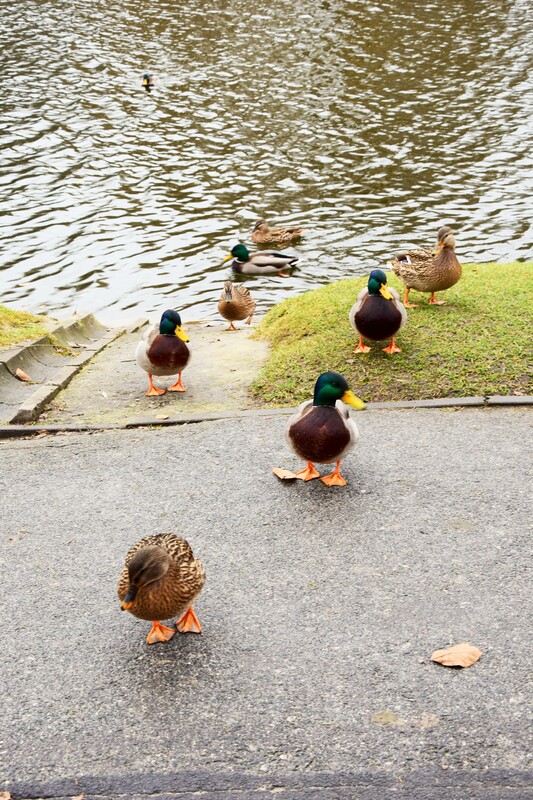 Because people give them bread, ducks are never hungry and they are always happy. There are our favourite things like balloons with helium and cotton candy. After helium we have funny voices. For kids there is a little pony that they can ride – that’s so cute. And there is a mini-zoo with special birds as well. Next to the park there is the museum of the history of our city and it’s also a very interesting place. When we were young girls, we didn’t know each other, but we love this place the same. It is a special place for us and we think that everyone should see this park. 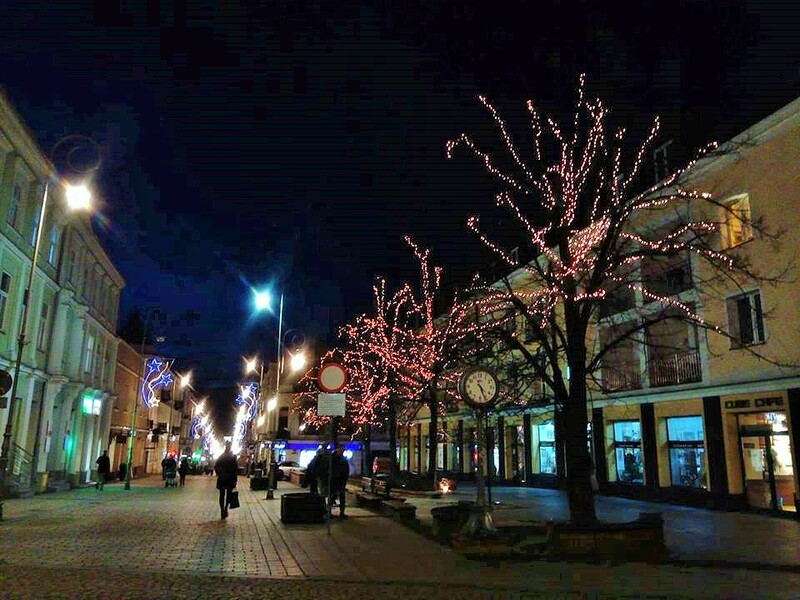 We think the best place in Kielce is Sienkiewicza Street. It might seem that it is only an ordinary street, but in our opinion it is the greatest place to meet your friends and get to know something about our city. Sienkiewicza Street is the main commercial, historic and the most famous street in Swietokrzyskie Voivodeship. Sometimes it is called the “artery” of Kielce. It was built in the 19th century. Shops, department stores and cafes are located there as well as historic buildings like monuments. 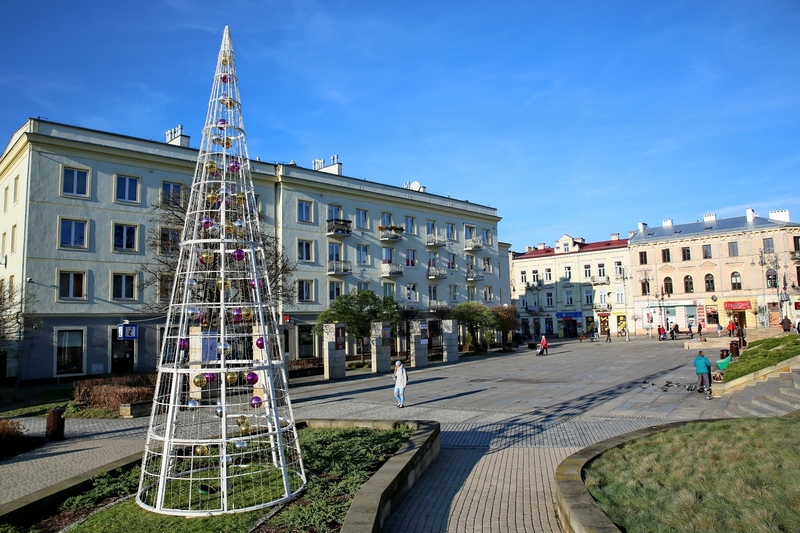 It is 1270 meters long and runs from the railway station to Moniuszko Square. One of the most recognizable buildings in Sienkiewicz Street is Stefan Zeromski Theatre. It is an old edifice with a mysterious atmosphere. In the theatre are staged really good plays so this place is worth visiting. It’s good to know that our main street is completely closed for cars so you can see a lot of pedestrians walking down the street. Many events take place here throughout the year, for example Dzień Kielc (Kielce Day). Then all along the street there are stalls with traditional craftwork and local food. 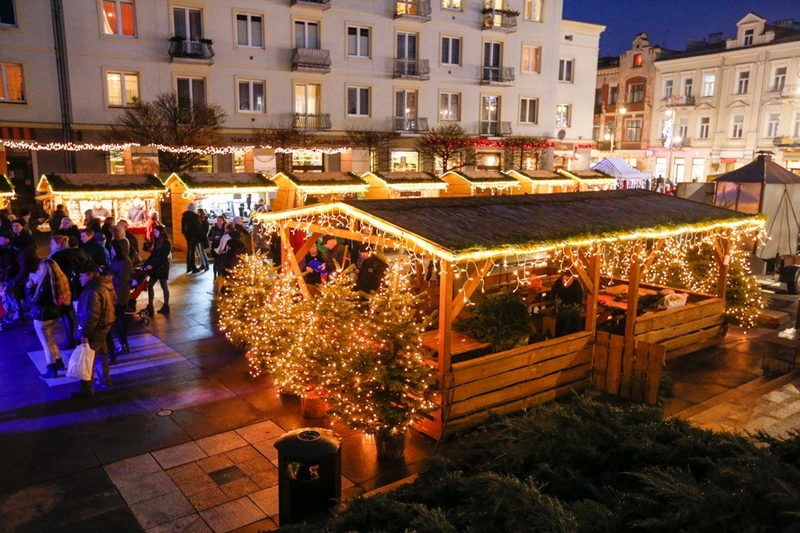 In mid-December Christmas Market starts and is visited by both city residents and tourists. One of the attractions is a living Nativity scene (il presepe). Sienkiewicza Street is a very charming place, especially when it’s dark. We can see the whole street graced with lamps. There is also a small square next to Sienkiewicz Street. It is called Artists’ Square. In this square there is a fountain and an art gallery, but the unusual fact is that there is a boar statue too! The monument is associated with the legend about the founding of our city. However, when you want to eat a delicious dessert and meet your friends, cafes in Sienkiewicza Street are a fantastic choice. For sure, you will drink a good cup of coffee and eat the best cakes and ice-cream in the city. 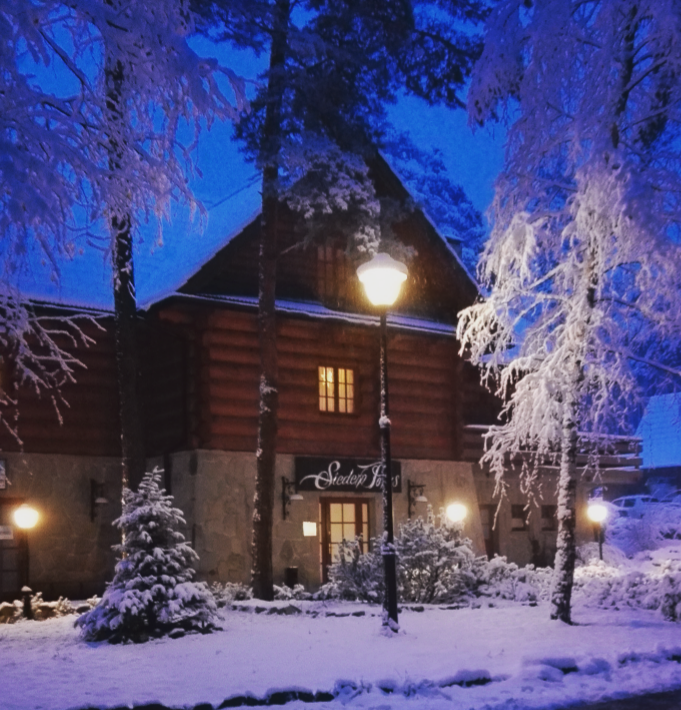 We recommend a walk down magical Sienkiewicza Street!!! Kadzielnia is an amazing place! Why? This is the hill in the south-west of Kielce, the capital city of the Swietokrzyskie. Kadzielnia is the highest concentration of caves in Kielce (there are 25 here), the longest cave is Explorers’ Cave. By Kadzielnia passes the red path leading city tourism. The caves are visited mainly by people outside of Kielce and a few residents of our city. During the two summer months the caves were visited by around 4,000 people! In the southern part of the hill there was built an amphitheatre with more than 5,000 seats. There are numerous concerts and events here, for example: “Świętokrzyska Gala Kabaretowa”. A characteristic element of Kadzielnia is a historic monument. Kadzielnia is ideal for meeting friends and walking with a girl. It is worth going there at any time of the year. My favourite place in Kielce is Kadzielnia Reserve and Amphitheatre. This is the hill made of limestone surrounded by green area. 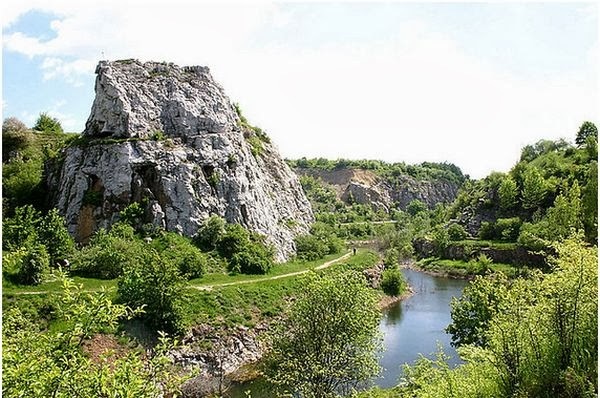 Kadzielnia has the largest number of caves in this region and it is a geological area. You can explore one big cave, which combines three smaller caves. Almost 400 million years ago this reserve was flooded with the warm emerald sea but now there are no traces of it. A few years ago there was built a modern amphitheatre, similar to the ancient Greek theatre. 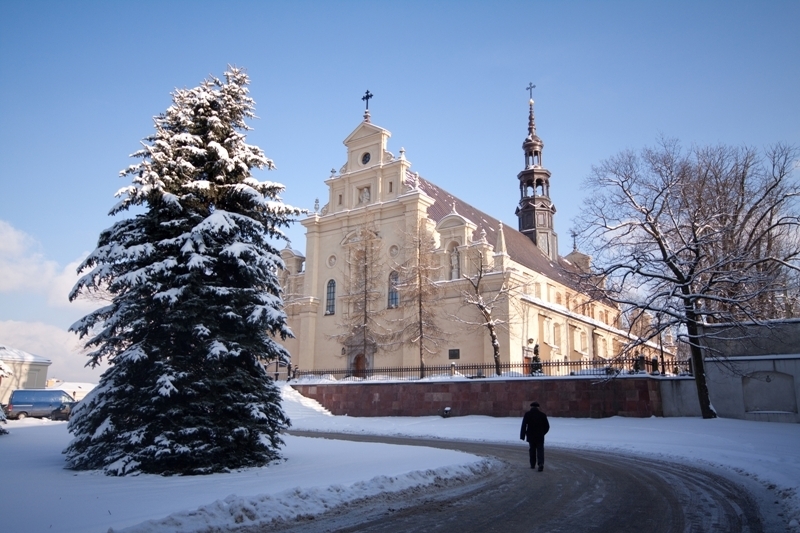 Kadzielnia is a tourist attraction and the place where big concerts of famous artists and cabarets take place. Last holidays a BMX and a skateboard show took place. That was an amazing experience, because I saw some awesome stunts and bike tricks so close. In my free time I often hang out with my friends there, we sit near the reserve and talk about everything. Recently the old skate park area has been modernized and enlarged close to Kadzielnia. I can recommend this place to any tourist who will come to Kielce. 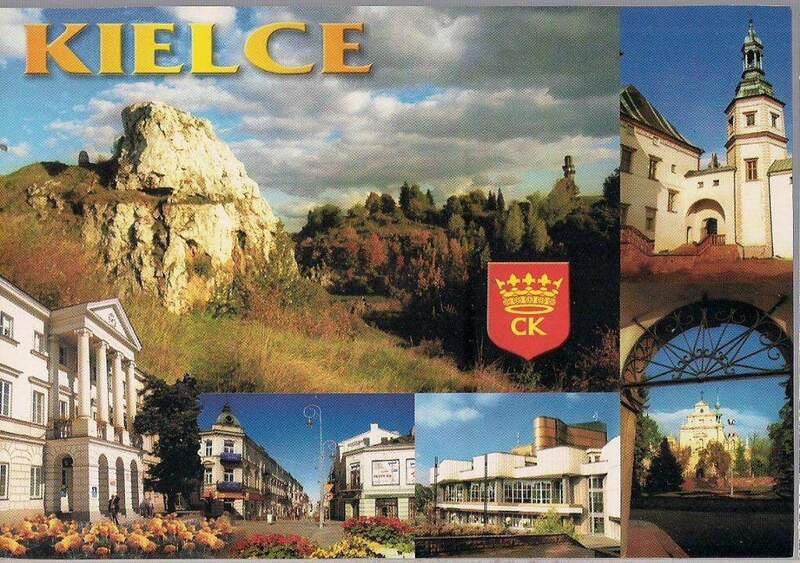 There are many places in Kielce worth visiting but I want to talk about a place called Kadzielnia. Not only can you see a beautiful natural landscape but you can also have many more active types of fun because of an amphitheatre that was built there. You can go to concerts that usually are like all other concerts with lots of fun. But sometime cabaret shows take place, which for people from other countries may seem strange but in Poland cabarets are still a popular source of entertainment. This place is a beautiful combination of a naturally made landscape improved with human architecture. When this place is off season, it’s perfect to relax because not many people go there at that time. I think it may be a good place to take some photos too because this place looks amazing. I’m sure you can take some awesome photos there to show your friends and family. You can also explore caves there! It is legal as long as you go to the one called Explorers’ Cave. If you are interested in geology or you just simply like caving, you should give it a go. 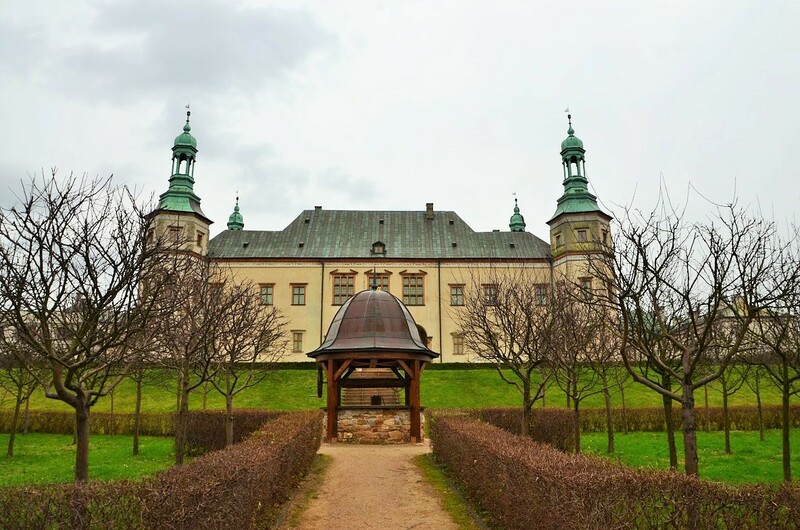 To sum up, I think you should at least consider going to Kadzielnia because you can always find something that you like there, from loud concerts to silent cave exploration. The Kolporter Arena is the stadium of Korona Kielce football club. This stadium is the largest and the most modern of its kind in the area. It was built in 2002-2006 for 15,500 people! It is located right next to my school so I always know what’s going on there. Last year there was a really big event. 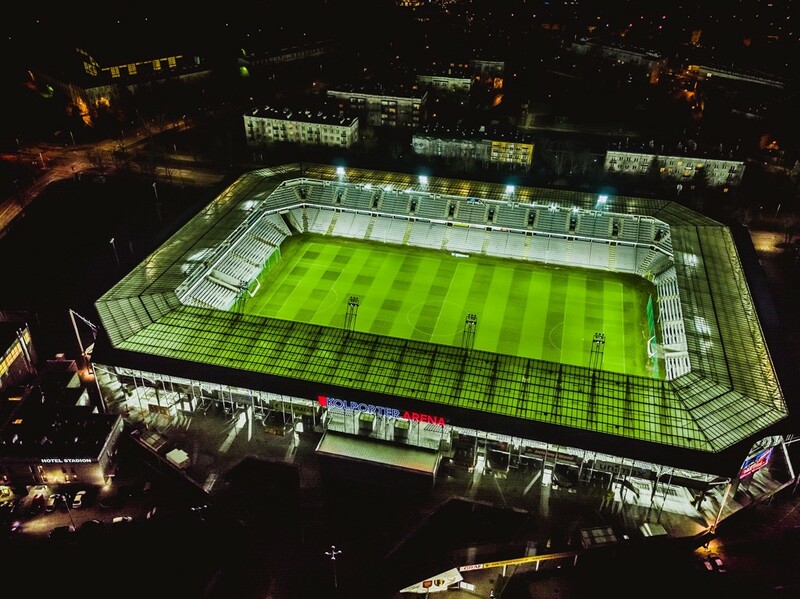 Kielce became the European capital of football for the first time and there were the matches of the UEFA European U21 Championship. We welcomed a lot of football fans from Europe! 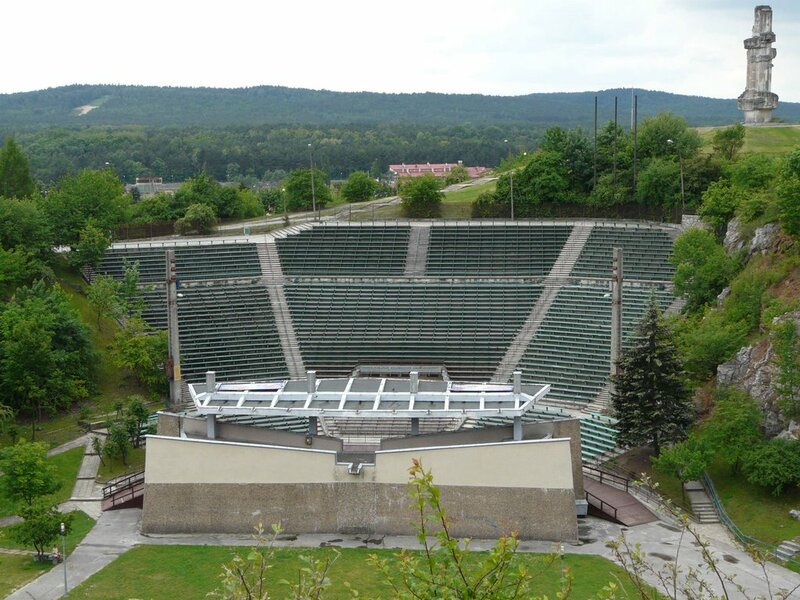 My favourite place in Kielce is the Forest Stadium, situated in the middle of the forest on the outskirts of the city. The opening was held on June 12, 1933. During World War II it was a place of mass death of many people from Kielce. Not far from the park there is a Jewish cemetery, which is often visited by youth tours from Israel. It is a beautiful place especially in winter. It is worth visiting – the landscape is truly amazing. The athletics stadium is not the only attraction, there is also a ski slope, an ice rink along with a lot of hiking trails and the rope course in the summer. This place is for people who like sport. You can go skiing or ice skating, and if you like cycling, you can visit the bicycle obstacle course. There is also an equestrian centre, where anyone can try horse-riding and the Exotarium Valley of Reptiles with a lot of strange but interesting animals. The Forest Stadium is a huge and beautiful park for people who like long walks. This place is not only for young people, seniors can relax in hotels or take a walk down the Path of Health. When I went there with my friends last time, we tried to teach my friend skating and we had a lot of fun. If you like photography, I recommend the Forest Stadium as the place for the perfect session. The Park is the site of numerous meetings with friends. I love this place, it has its magical character! In Riccione there is a very well equipped thermal centre that offers a plenty of treatments. It’s open to the public and it can provide services for people that just want to relax or have some particular treatment, but also for ill people that can find in this centre qualified staff and facilities. It also has made agreements with some of the hotels allowing the guests to reach the centre easier and also to have some reductions. The centre has also an interesting, acient history. In the ruin of a chapel near the modern centre a plaque has been found. On it we can read “Viator siste gradum – ab aqua decorata miraculis – salutem habebis ” that in latin means “You will be healed, traveler, if you will stop here to drink this miraculous water”. Indeed the beneficial properties were discovered by the romans soldiers and later also Diocletian, the emperor, tried them by himself. 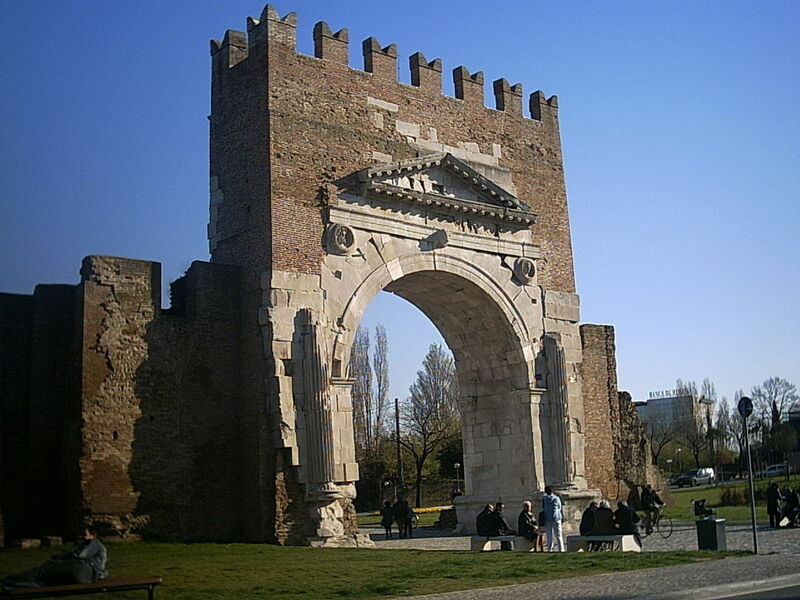 The Arch of Augustus in Rimini was consecrated to Emperor Augustus by the Roman Senate in 27 BC . It is the oldest Roman arch left. It marked the end of the Via Flaminia that connected the city of Romagna to the capital of the empire, then merged into today’s Corso d’Augusto, the maximum decumanus, which led to the entrance of another street, the Via Emilia. On the right side of the Marecchia river, where the consular roads of Popilia, Emilia and Flaminia meet, on the right side of the Marecchia river lies the Romagna town of Rimini, which has always skillfully combined modernity with its great historical and monumental importance. of coastal districts, with cutting-edge equipment, which for decades have made it one of the most popular seaside resorts in Europe. The arch of Augustus restored in recent times has returned to its former glory. 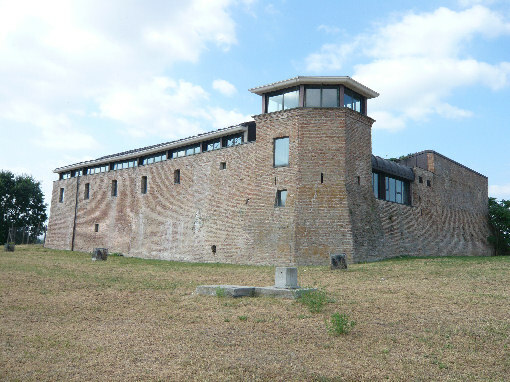 One of the historic buildings you cannot miss in Riccione is Agolanti castle, also called the White Tomb. The Castle, infact, was born as a private residence and takes its name of castle just for its particular form. Home to numerous cultural events and exhibitions, the monument was born as a residence of the family who commissioned the building, and gave its name. During the period when the family was at the height of fame, the castle hosted many important figures of European culture, traveling to Rome and making the Grand tour. The various changes of ownership have damaged the structure of the building and the 1786 earthquake has worsened the situation. A recent restoration has helped to improve the structure, which today can be visited by the public. 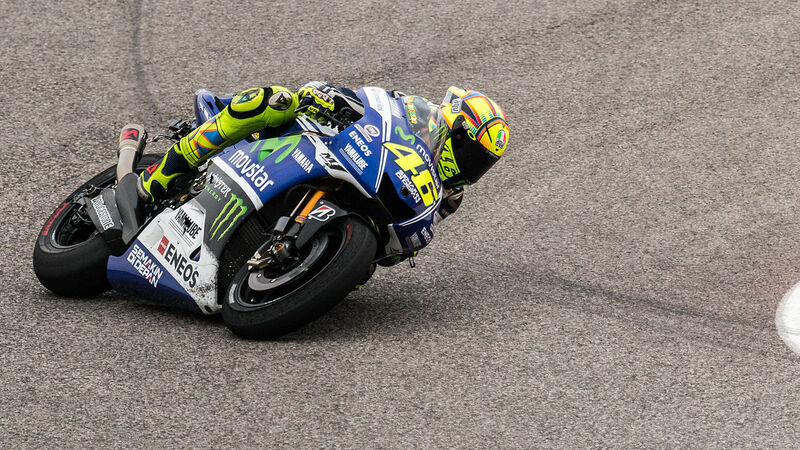 The Misano World Circuit “Marco Simoncelli” is one of the most famous race tracks in the world. It hosts MotoGP, World SBK and DTM Championships, just to mention the most relevants. The track itself hosts also various little tracks used by children and amateurs to race and have fun with karts and mini-motorcycles. the Misano Grand Prix is, in fact, his “home” GP, because he live in Pesaro, just a few kilometers off the track. Rimini and Riccione are also birthplaces to a lot of famous riders such as Alex De Angelis, Mattia Pasini and Enea Bastianini. Motorcycles are not just vehicles, they are a passion, down here! 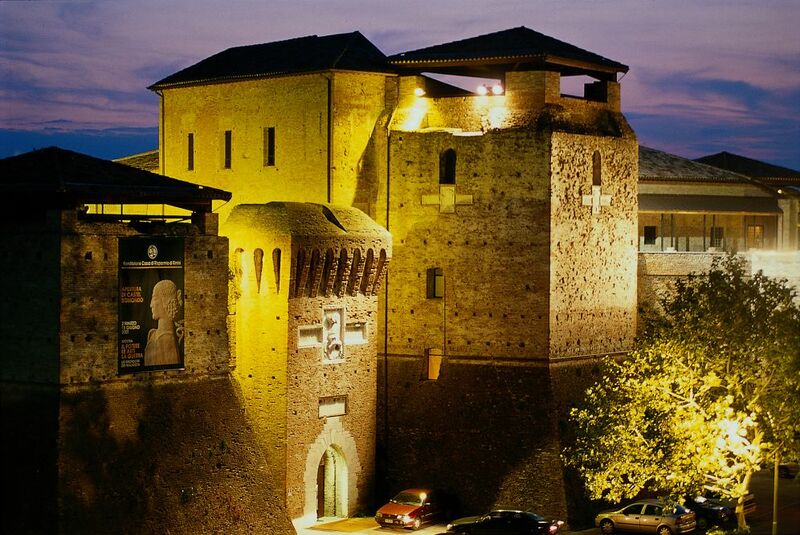 Castle Sismondo is the majestic fortress of Rimini that stands out in Piazza Malatesta, with its large square towers and the walls. The castle was built in the fifteenth century by Sigismondo Pandolfo Malatesta, is the only central survivor. Sigismondo began construction on March 20, 1437. The castle was conceived as a palace and fortress together, as a seat for the court and for the garrison and as a sign of power and supremacy over the city. Castle Sismondo now hosts in its fascinating rooms art exhibitions, events and presentations. A very interesting curiosity is that this new year for the first time the Castle was the protagonist of a fireworks display, which left both tourists and citizens astonished. If you come to Riccione, you can’t miss a day at “Aquafan”, one of the first beautiful water parks built in Italy. Inaugurated by 1987 the park offers many important classical aquatic entertainment (water slides, wave pool, slow and fast river), but continues to be distingued by the search for the most innovative and bizarre aquatic novelty, and for the service that every year offer to the young, like the disco, and evenings with internationally renowned Djs such as Davide Guetta, Gabry Ponte, LMFAO, Skrillex. 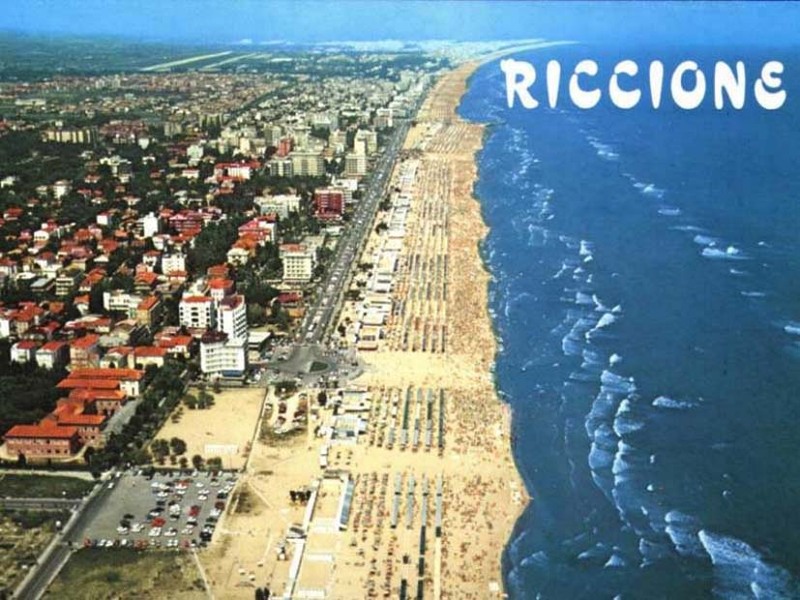 A lot of tourist in summer choose Riccione for its beaches: they are many and very beautiful, the waterfront is really stunning and the temperature last summer reached 40°. The beaches offer a lot of leisure activities: swimming pools, tennis courts, table tennis, children entertainments and in the some beaches you can practice sports such as kitesurfing. We also have a typical day in summer which is the warmest, that is August 15th, the beaches are full of people, you roll in the sand and you run for swimming, it’s great fun. The park is located in the area of schools in Riccione , it’s very big and large , you can find games for children’s entertainment, like swing and slide etc. It’s full of animals, there are swans, turtles, ducks, peacocks in various color,fishes, guinea pigs and doves. Here you can leave the dogs free in fences. Park of Resistence it’s very quite , for couples, family, children, all types of people. The Cocoricò of Riccione is one of the most famous nightclub in Italy.Located on the Riccione’s hills it is considered the temple of techno music since the 90’s. 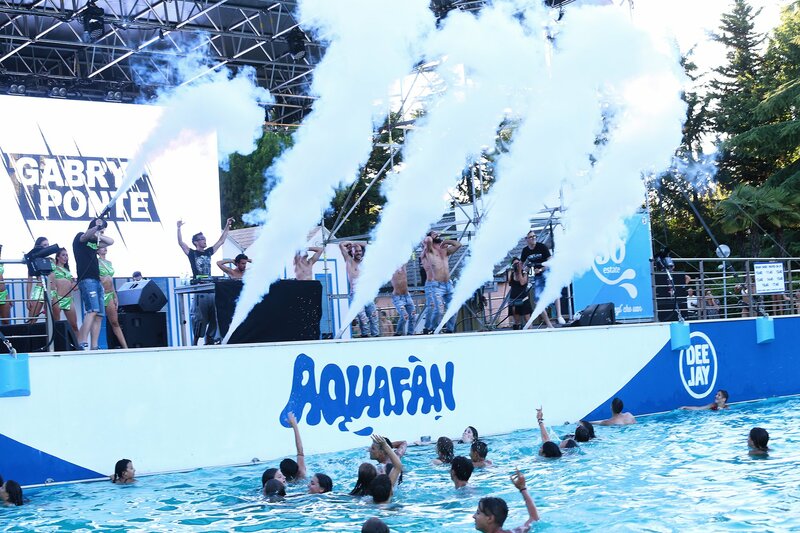 It has been hosted and still hosts famous djs from all over the world like Loco Dice, Nina Kraviz, Marco Carola, Carl Kox. The Cocoricò is also called “La Piramide” thanks to its pyramidal shape. It consists in five rooms, the principal one and other smaller. 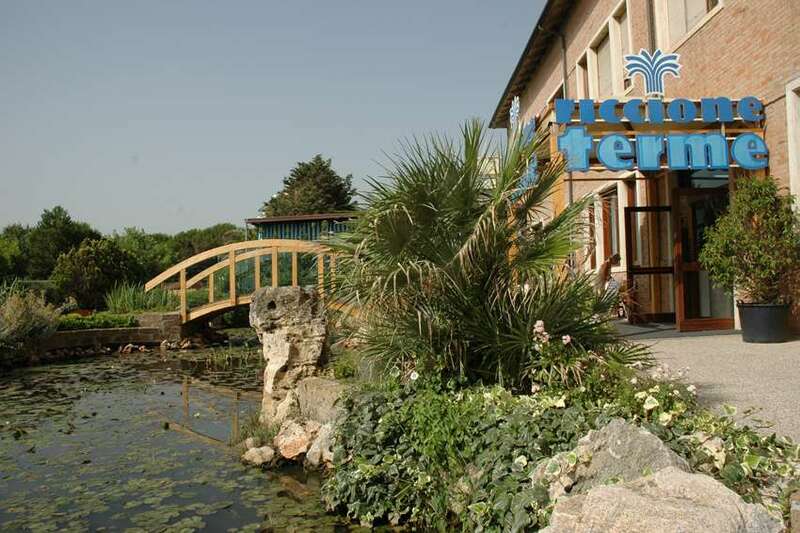 Oltremare is a naturalistic-technological theme park in Riccione, where we find animals both of the land and the sea. 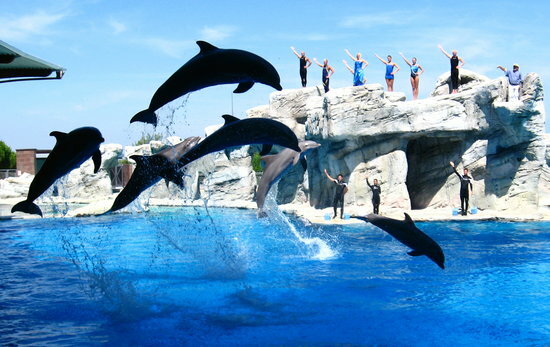 The attractions are particularly concentrated on what concerns the animals of the oceans, on the presence of display cases, aquariums, marine shows and small nature reserves. -Farm shows area where you can admire mice, geese, hens, pigs, goats. -Natural route: it is a tourist route always designed to make known the various species of animals in the forest and prairie. It, containing small waterfalls, reproductions of some animals, and small aquariums, goes to merge with the museum area where there are reproductions of sea cetaceans. The domus of the surgeon, dating back to the 2nd century AD, extends over 700 square meters. The excavation has also brought to light other important structures: the remains of a late imperial dwelling, traces of an early medieval settlement and a large burial ground underneath that highlight a remarkable historical stratification. Of great importance is the large number of finds and mosaics found inside: well preserved, they allowed a faithful reconstruction of the house and the identity of the owner, as well as shedding light on a fascinating past. Perhaps the most exceptional find is a collection of 150 surgical instruments that left no doubt about the identity of the landlord: a doctor. It seems that Eutyches, this his name, came from Hellenistic circles and, as often happened in antiquity, he had then formed on the battlefields. In fact, the tools found were used above all for bone trauma and wounds, leaving to imagine that Eutyches was a military doctor.